Consumers now have many–often too many–choices to make before they buy a product or service. Sorting through all these choices can be difficult when the marketing is dishonest. Unfortunately, many companies try to take advantage of confused and overwhelmed consumers by overselling what they can do or misleading the consumer down the wrong path. Federal and state laws are designed to protect consumers from these devious sellers and to force wrongdoers to correct their dishonest practices. 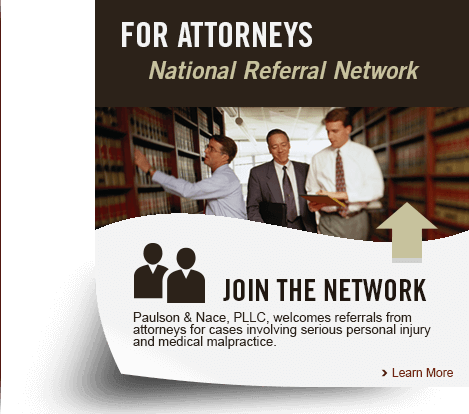 Paulson & Nace, PLLC, a family-owned and operated West Virginia law firm, has been working for 40 years to protect injured clients. This representation now includes advocating for clients who bought products that did not work as intended or who, worse, suffered physical harm because of false advertising. We bring claims in the right courts and the right agencies to make unprincipled sellers pay for their wrongs. “Bait & Switch” advertising. This is a fraudulent sales tactic that lures consumers into a retail setting on the bait of product availability at a low price. The seller then switches the consumer to a more expensive product alternative knowing that the original, low-priced product was never really available. Deceptive contracts. Many sales contracts have hidden charges, concealed terms, and substantial penalties for untimely payments that ultimately mean the consumer will have to pay much more than intended. Misleading labeling and packaging. Objects may look one way and one size in an ad or in the outside package, but turn out to be much different when the product is actually opened. Inflating prices artificially. Some companies falsely inflate the price of a product and then offer a discount to make the consumer think he/she is getting a bargain. Other false practices, such as manipulating descriptive terms, failing to disclose crucial information or using images that do not truly represent the product are also unlawful. Consumer protection remedies can range from simply alerting the right agency or authority about the wrong, to more complicated legal actions. Some of the agencies that can be contacted are the Better Business Bureau and the Office of the Attorney General’s Consumer Protection Hotline at 800-368-8808. Filing a claim with the Federal Trade Commission. Seeking monetary damage such as partial or full refund of the purchase price. Filing a class action on behalf of multiple consumers who suffered harm from the same seller. Demanding payment of penalties and legal fees for violation of relevant statutes. Seeking injunctions to order the business to stop the deceptive practice and to include corrections in their advertisements. Consumers who discover that that a merchant misled them into making an ill-advised purchase have the right to call the merchant on their deceptive behavior through proper complaints and legal actions. Consumers work hard to have the money for necessities, let alone luxuries. At Paulson & Nace, our lawyers fight aggressively for consumers who relied on the merchant or manufacturer’s advertising, only to discover the sales pitch was false. Whether you suffered loss of money or a direct injury such as a hair product that burned your scalp, our West Virginia lawyers fight for your full benefits and rights. The West Virginia law firm of Paulson & Nace, PLLC, makes sure consumers get what they pay for. Our family of lawyers represents consumer clients in the West Virginia area by investigating all advertisements, labels, products, and packaging. When justified, our lawyers file lawsuits to make merchants, retailers, marketing companies, and manufacturers pay for their false advertising and correct their deceptive practices. Please call us at 304-741-8079 or fill out our online contact form to schedule an appointment. Our office is located at 3501 Maccorkle Ave SE, Charleston, WV 25304. A landmark U.S. Supreme Court decision establishing the law on expert testimony. $95 million verdict, including $75 million in punitive damages. $530,000 verdict for birth injury. $1.5 million verdict for loss of kidney due to malpractice.